More commonly known as holy basil, tulsi has been used medicinally for thousands of years. Holy basil, or Ocimum sanctum and O. tenuiflorum, is closely related to the common basil herb used in cooking. Tulsi has been used in Ayurvedic medicine as an adaptogenic herb to improve the body's ability to cope with stress and disease. The herb has been used to treat respiratory ailments, stomach problems and even heart disease. The University of Michigan Health System recommends taking 1,000 to 2,500 mg of the dried powdered leaf per day. Tulsi may help in treating asthma-related symptoms. Medical studies have found that taking tulsi extract can improve breathing in people with shortness of breath and other respiratory ailments, according to the Herb Growing & Marketing Network. Traditionally, tulsi has been used to treat coughs, mild upper respiratory infections and bronchospasms, as well as bronchial asthma when combined with ginger and black pepper. Animal studies have found that tulsi extracts can stop constriction of the bronchial passages, and some preliminary clinical trials in humans revealed that the herb improved breathing function and reduced the frequency of attacks in people with asthma, states the University of Michigan Health System. The subjects in the clinical trials took 500 mg of tulsi three times daily for one month. Holy basil may help control blood sugar levels in type 2 diabetes patients. The University of Michigan cites preliminary clinical trials which found that taking 1,000 to 2,500 mg of tulsi per day can lower blood sugar levels. The Herb Growing & Marketing Network also points to a study conducted in 1997 at M.S. University of Baroda in India, where medical researchers gave 17 patients with non-insulin-dependent diabetes mellitus 1 g of holy basil leaf per day for 30 days and compared the effects to 10 other patients who were given no supplementation. Both groups of patients continued to take their anti-diabetic medications and follow their usual diets, but the participants who took the tulsi leaves experienced a 20.8 percent reduction in their fasting blood glucose levels. The test group experienced an 11.3 percent reduction in their total cholesterol levels as well. Tulsi is often used externally to treat inflammation and skin disorders, and it may be useful in resolving dermatitis from poison oak and poison ivy. 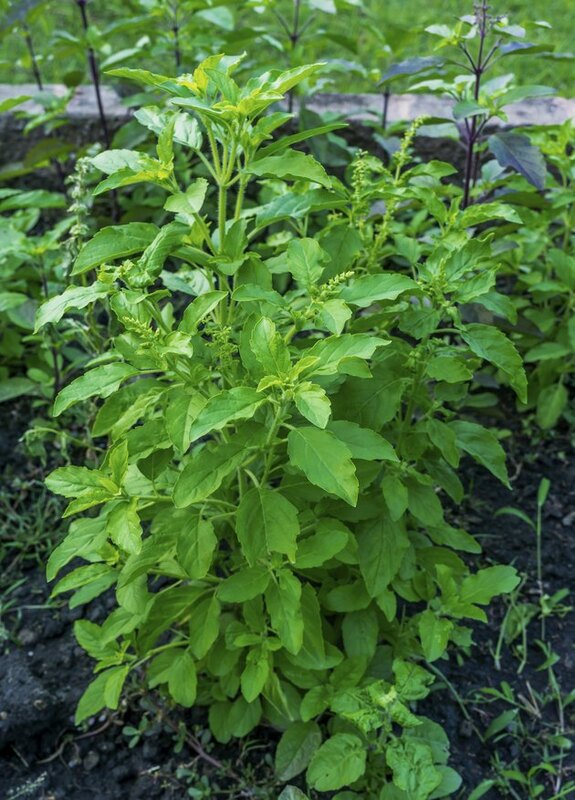 Extracts of holy basil reduced pain sensitivity and improved wound healing in animal studies, states the University of Michigan Health System. Also, tulsi leaves contain an essential oil comprised of eugenol and other volatile compounds which have been shown to have anti-inflammatory and antioxidant effects in test tube studies.